Cover your towing needs with Curt and save on shipping! - Ford F150 Forums - Ford F-Series Truck Community. Looking to get a new trailer hitch for your truck and save your money? Curt – one of the leading manufacturers of America gives you this opportunity! 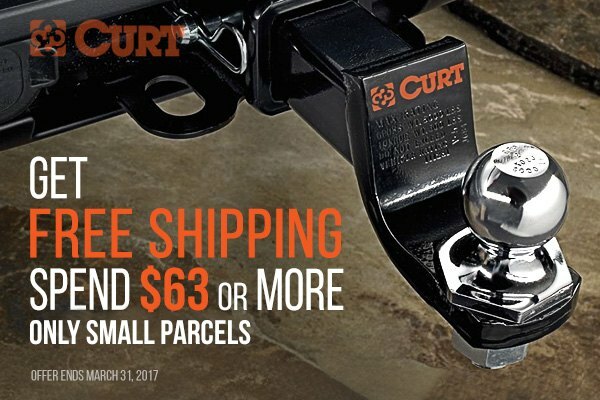 Spend $63.00 or more purchasing Curt products and receive FREE Shipping for small parcels. This limited time offer is valid from September 19 through March 31, 2017. Curt product line includes trailer hitches, ball mounts, goosenecks, towing accessories and much more. All Curt trailer hitches are customized for your truck, powder-coated for corrosion and rust resistance. Most of them feature bolt-on installation with no welding required and come with mounting hardware. Curt Hitches are crafted from high-grade materials using precision robotic welding for maximum strength and durability. Build tough enough to provide years of reliable towing, Curt is what you need to cover your transportation needs! Quick Reply: Cover your towing needs with Curt and save on shipping!